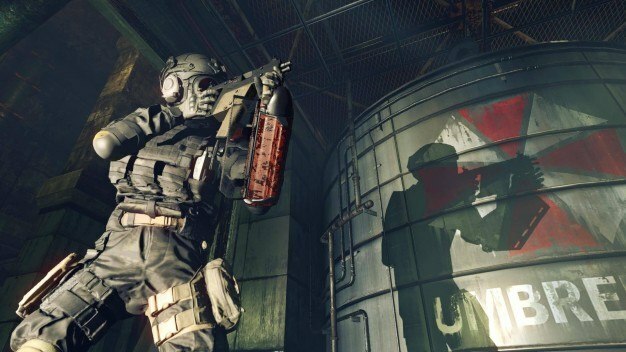 New Umbrella Corps gameplay details revealed! Ah, Umbrella Corps – are you Resident Evil? Are you [insert your favourite competitive multiplayer shooter]? Are you both? If you’re like me, you were probably waiting for some finer details about Capcom Osaka’s new entry into the Resident Evil franchise (or at least set in the Resident Evil universe) before deciding whether or not to get invested. Fret no more – Capcom released new gameplay details and assets for this unknown quantity floating around in the bubbling pit of zombie shooter games. A little while back, a trailer covered “One Life Match” mode, where players face off in 3 v 3 battles lasting only three minutes – no, don’t pre-empt me, you don’t get three lives, just one. You heard me – no respawns. Today we’ve been introduced to a new “Multi-Mission” mode which supports up to six players in a match and awards victory to the first team to win 3 out of the 5 rounds. Both of these modes sound pretty damn hectic and stressful to me, but as the name implies, there’s more than one type of mission to be enjoyed per game. Each round, the game will cycle through 8 different rulesets at random, which allows the same team members to enjoy a heap of different gameplay experiences. Better yet, Umbrella Corps offers an expedited matching process for quickly getting into a game, so you’re getting a seamless, consecutive and randomised gaming experience and not waiting around too long before you get to bust some heads! You better stay aware and keep your guard up – that last round where you wiped the floor with your opponents may have been the only win you get. Umbrella Corps is set to be released digitally for Playstation 4 and PC across North America and Europe in May 2016 – not too far away! Not sure if I’m quite ready to sink my teeth into something like this, but if I did you can bet that there wouldn’t be any zombies sinking their teeth into me! …unless the Protector ruleset came up – then I might get nibbled on a bit.